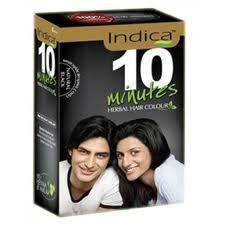 Buy Cavinkare Indica 10 minutes Herbal Hair Colour - Natural Black. Dyeing is a time consuming process, usually takes upto 30-45 minutes for any regular dye to colour ones hair. Today’s consumer is always finding himself at a loss of time for personal grooming & care. Presenting Indica 10 minutes - a new herbal hair color that covers 100% greys making you young and providing great looking Natural black hair in a matter of just 10min only - “Kudrati Kale Bal, Dus minute mein Done” (Natural Black hair Done in 10 mins). Indica 10 min has been accepted very well with people who are on the move and are hard pressed for time in their busy daily schedule. Indica 10min’s primary target is the fast paced consumer in his late twenties to mid thirties. It has been able to transcend across the country gaining acceptance from consumers with its unique benefit and proposition. Indica 10min – is a patent applied product with superior breakthrough technology developed to delight consumes. Indica has been a pioneer in providing revolutionary herbal powder hair colour with softener and now it just takes 10 minutes. Cleanse a small area of skin behind the ear or the inner surface of the forearm using soap and water. Apply a small quantity of hair colour as prepared for use to the area and allow it to dry. After 24 hours, wash the area gently with soap and water. If no irritation or inflammation is apparent, it may be assumed that no hypersensitivity to the hair colour exists. Contains Amla, Bhringraj, Methi, Henna, Hibiscus, P-PDA and resorcinol. Empty entire contents of both the sachets into a non-metallic bowl. Add 55ml water and mix to uniform consistency in a non-metallic bowl. Leave it on hair for 10 minutes. No need to apply shampoo. Rinse with water for natural colour.